130. Subway was notiﬁed on multiples occasions of Jared�s sexual interest in children and alleged criminal activity. 131. 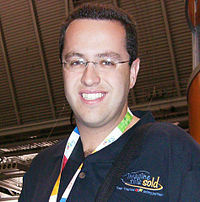 Subway signiﬁcantly relied on Jared for the company's ﬁnancial success. 132. Subway was notiﬁed of Jared's multiple depravities prior to Katie marrying Jared. 133. One Subway executive even responded to one of these complaints that Jared's relationship with Katie would lessen the likelihood that he continued this conduct. 134. Subway had a duty to exercise reasonable care upon receipt of complaints of Jared's sexual interest in children. 135. Subways relationship with Jared and use of Katies, B.F.s and Q.F.s likenesses created a duty Subway owed to Katie, B.F. and Q.F. 136. By ignoring and failing to report the allegations about Jared's sexual interest in children and alleged criminal activity, Subway breached that duty. 137. By utilizing the likenesses of Katie, B.F. and Q.F. despite its knowledge, Subway breached that duty. 138. But for Subways failure to warn Katie or failure to report Jared to law enforcement, Katie would have never married Jared. Did you know that if you suspect child abuse, it is MANDATORY to report it? Apparently some others didn't know this. Jared said some pretty sick things multiple times that went over-looked and not reported. Nobody even told his wife! Can you imagine how one would feel finding something out like the "Jared Fogle Scandal" thru the media, and not even from your own husband? In a world as there is today, it is difficult to think of someone you love as a monster - and act upon that as so by reporting them or trying to get them help before it's too late. Always go with your gut feeling and instincts as a parent. As for the McLaughlin vs. Subway trial, what do you think of Katie's position with her husband? Will anything come out of the lawsuit? Let us know! If Subway knew about Jared's activity in 2004 and did nothing, they chose profit over children's safety. I met Jared once, he was a very nice man. I can't believe all this that they are saying about him.